Did you know that more than a fifth of the Free State is made up entirely of water? Unsurprisingly, this means that Maryland fishing is doing great in both its freshwater and saltwater grounds. 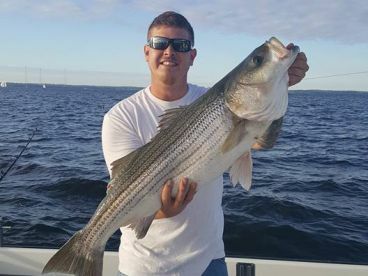 With the Atlantic Ocean to the east, Trout streams in the west, huge numbers of Striped Bass in the Potomac River and Chesapeake Bay, fishing charters in Maryland have their work cut out for them. Various fishing tournaments attract anglers from all over the country. The tournament season traditionally starts off with the Memorial Day Tournament, and keeps on going almost until winter. Bass, Tuna, Rockfish, Marlin.... just name a fish and there’s bound to be a tournament you can sign up for. 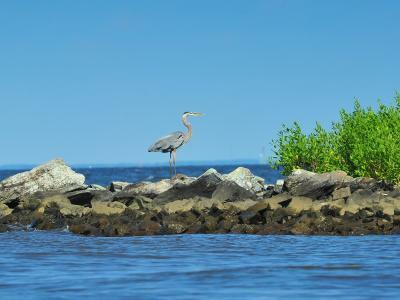 Fishing trips in Maryland depend on what someone wants to fish for during their stay. 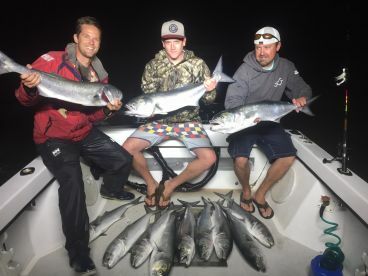 Whether you’re looking to hunt Tuna in the Atlantic or just fish for Bass in one of several productive rivers, there’s something here for everyone. 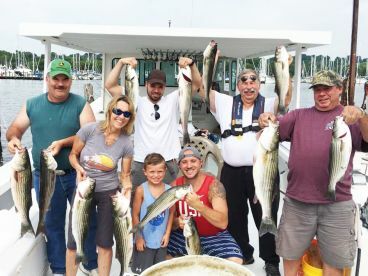 Also acting as the natural border with Virginia, Potomac River is among the best fishing spots in Maryland and home to quite a number of Largemouth and Smallmouth Bass. A great place to find the former is anywhere from the capital down to the Route 301 bridge. As for the latter, be sure to check out areas near Knoxville, Sandy Hook, and Brunswick. The western shore of the river makes for some of the most scenic Bass fishing you can get anywhere. When you’re in sight of the most famous monuments in the USA, the experience is truly unique. Keep that in mind the next time you visit Washington DC. Located in Garrett County, Deep Creek Lake is your number one stop for any lake fishing needs. With over 3,800 acres worth of prime fishing grounds, it can fit a lot of anglers! This area is also a very popular tourist destination, making it a gathering point for a large number of anglers on vacation. Local Largemouth Bass are commonly found in shallower, weedier parts, while Smallmouth tend to stick around rocky bottoms and steep drop offs. 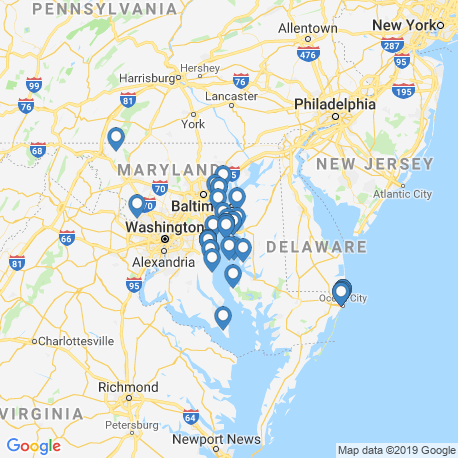 Remember how more than one fifth of Maryland is water? Most of that is due to Chesapeake Bay. 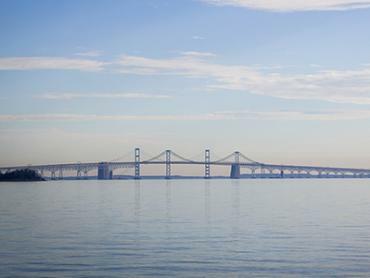 Also known as “Maryland’s greatest national treasure,” Chesapeake Bay is America’s largest estuary. You can find a whole bunch of different saltwater species all over the Bay at different times of year. Expect to be spoiled for choice if you decide to visit. As far as Bass fishing in Maryland is concerned, it doesn’t get any better than this. 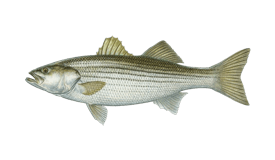 Striped Bass is also known as “Rockfish” around here, so don’t let it confuse you. The local residents like their fish so much that they named the town of Rock Hall after it. 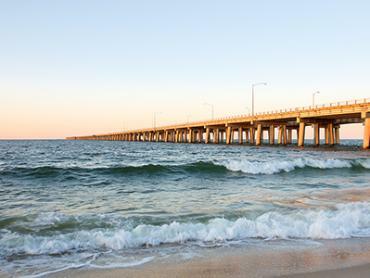 The crown jewel of Maryland’s coastline, Ocean City is its single gateway to the Pacific. As important as that is, it’s far from the only thing you can expect to experience fishing-wise. Families looking for a short but fun time on the water absolutely adore Flounder trips. On the other hand, there’s also the ever popular Bass Grounds reef, the nature of which is pretty self-explanatory. But what attracts anglers the most are definitely long trips to the continental shelf. Head on out to the Baltimore Canyon and go after the likes of huge Marlin, all kinds of Tuna, Wahoo, and Mahi Mahi. If you’re especially lucky, you can look forward to a Swordfish or two. Feel free to experiment when tackling Striped Bass — they’re not very discriminating when it comes to bait. 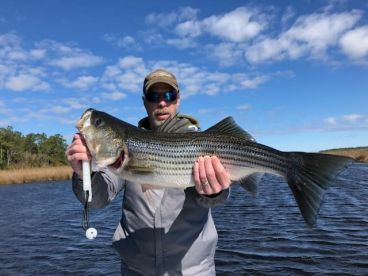 The classic option is live-lining Croakers or Menhaden for the easiest go at catching loads of fish. If you like to experiment with other techniques, try using topwater plugs, jigs, or poppers — the fish will go after all of them. 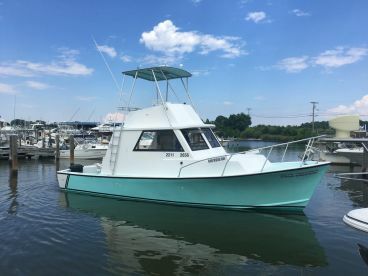 Once you set sail offshore, trolling is the way to go for big Bluefish. 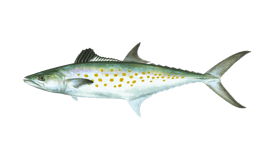 Captains either use rigged Ballyhoo, Mackerel, Squid, or artificial trolling lures. As for Tuna, chumming and chunking prove highly dependable time and time again. Most captains prefer to go fish out at the 100-fathom curve for the best results. Be careful if you decide on night fishing in Maryland. Current regulations prohibit fishing any streams or non-tidal waters that contain Trout anytime between 10 PM and 5.30 AM. You should also be aware that felt-soled waders are banned statewide due to health concerns. You can check out the most recent regulations here. That is also the place to buy fishing licenses online if you aren’t going with a charter guide (they have all licences included). Fishing at the start of the year is far from the best it can be. If you’re up for some Tautog action, by all means, but you’ll have to wait for other fish. 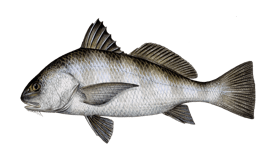 The Tautog bite is still going strong, and you can also look forward to Striped Bass if you’re near Ocean City. Most captains there are waiting for warmer times. March is when the inshore bite finally starts to recover. Family trips for Flounder in shallow waters have always been a popular way to spend the time. 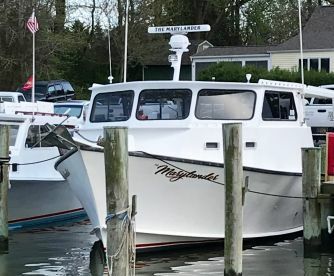 Whether it’s Black Seabass in Chesapeake Bay, or the Tautog, Striped Bass, Bluefish, or something else entirely, you’ll have much more freedom to fish than before. Spring is in full swing, and so is the festival season! Events like the White Marlin Festival and the Stars and Stripes Festival attract droves of people every year. 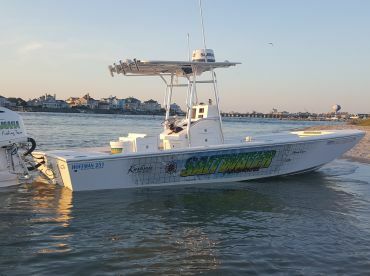 The Memorial Day Tournament kicks off the best time of year for offshore anglers. 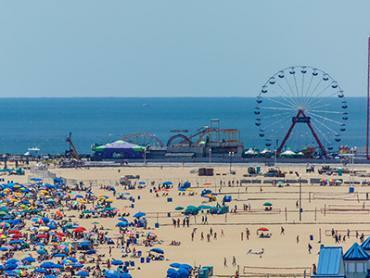 Head down to Ocean City and go after the big boys right now! As summer continues, the fishing just keeps getting better and better all around. Saltwater or freshwater, Tuna or Largemouth Bass, it’s a buyers’ market out there. Were you aware that Ocean City is home to the largest Billfish tournament anywhere in the world? Well, now you are! Lots of fun for both anglers and spectators. While the tournament season might start slowing down after an extensive couple of months, the fish are still biting like mad. Do yourself a favor and check out the awesome fishing. 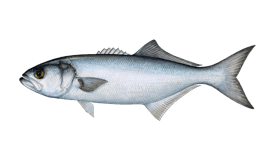 October can very well be called Seabass month in Maryland thanks to how good the fishing is. 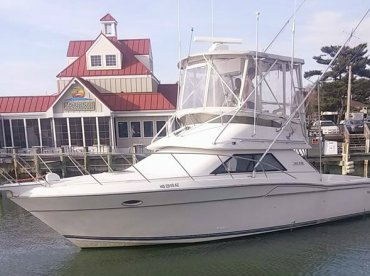 The Rockfish bite on Chesapeake Bay is also world-class. November is the last train to hop on for anyone interested in going after Speckled Trout or Flounder until the end of the year. Hop on while you can. As the year winds to a close, most anglers will be fully devoted to fishing Rockfish by the dozens. If that sounds appealing, you’ll have the time of your life out here. "Half-day on the Miss James II. " Be prepared for a range of weather and exercise some patience. Listen to the Captain and crew. October is my new favorite time to visit OC! Bring snacks, sun glasses, and jackets!!! !